The sophmore album The Rituals by Monocube is the first outing with one of the leading post-industrial labels, Malignant Records. Monocube has been working toward this release for several years now. It seems that Monocube has truly found their sound with this one. Where their first album focused mostly on drone ambient, The Rituals delivers a plethora of sounds, styles, and emotions. As their first foray into the mainstream of dark ambient, if one can call it that. The Rituals is a brilliant example of how versatile dark ambient can be, and how one need not always stick to the script. Blazing forward with an album which certainly retains some drone work, Monocube enters new territory on almost every track presented. The Rituals starts out with “Visiones III” a re-imagining and more refined version of the track which made its debut last year on Terra Relicta Presents: Vol. I Dark Ambient. The intensity is immediately obvious. The track seems to be summoning some demons from the nether realms, demons which will unveil their motives as The Rituals progresses. The album doesn’t fully deliver its assault on the senses until the following track, “Drowned Sun”. “Drowned Sun” is a combination of sounds which lean more toward a death-industrial output than dark ambient. Ghastly drones collide with irreligious vocal growls. The track smashes through the psyche paving a path in blood and bones which will only further fester as the album progresses. After the cacophony of violent noises presented on “Drowned Sun”, we move again into a slower more droning realm. “Downwards” is the first track on the album to feature a guest musician. Apocryphos, fresh off the release of another collaborative album, Echo, lends his unique take on guitar drone to the track. What we are presented with here is a relaxing yet deeply disturbing soundscape. “Downwards” takes the listener on a slowly evolving journey through the minds of Monocube and Apocryphos. The chemistry between the two musicians is immediately obvious. More collaborations between these two artists would almost surely continue to solidify this natural bonding of tortured souls. As the album progresses it becomes more and more obvious that these rituals unfolding before us are conjuring a wretched demon. This is not a faint-hearted attempt to give listeners some sort of meditation music. These are incantations which could likely have originated from the dreaded Necronomicon. Incantations which leave the conjurer shivering in his boots. As is so often the case with demonic incantations, The Rituals seems to be opening a portal to another realm of consciousness, and once opened the portal may well never be closed. “Totem Incantation” continues with the demonic screams and human cries of terror from “Drowned Sun”. Monocube enters territory which would seem at home with the likes of Shibalba. Visions arise of vast subterranean cathedrals. Gusts of wind billowing up from within the depths of the Earth, as some ancient being is brought back to the realms of man. The faithful watching, incense smoke burning their eyes and nostrils as the demons begin to materialize in their very presence. All these aforementioned forsaken emotions and visions continue to plague the listener, devouring their innocence as they continue through The Rituals. Each track manages to feel wholly fresh while simultaneously bringing something new to the table. The album draws to a close with two more collaborative tracks. Both seeming as natural as the first with Apocryphos. “Anthracite Glow” continues with this subterranean soundscape, while bringing in some ritual elements which immediately hint at the input of Treha Sektori. Hammering tribal drums complement the harsh yet somehow subtle drones. Treha Sektori contributes some of his most haunting vocals to date, seeming to bring the irreligious incantations to life. The album draws to a close with “Initiation” which features the talents of the lauded dark ambient mentor and musician Asmorod. “Initiation” is one of the more subtle pieces on The Rituals. It acts as a perfect close to an album which is as beautiful as it is wretched. Lonely gusts of wind mingle with demonic whispers, seeming to reach from the depths of the Earth, attempting to pull the listener back into its deathly grip. This horrific experience gently morphs into something truly beautiful. A lonely piano arrangement slowly materializes out of the black void. This small taste of comfort and refinement is the perfect close to the album. It leaves the listener in a state of exstacy, begging them to hit the play button once again, to return to those horrific moments. Not only is the music painstakingly perfected, but the album art is another gem of its own. Featuring paintings by Ksenia Gladushevska, Monocube is granted the perfect visual representation. 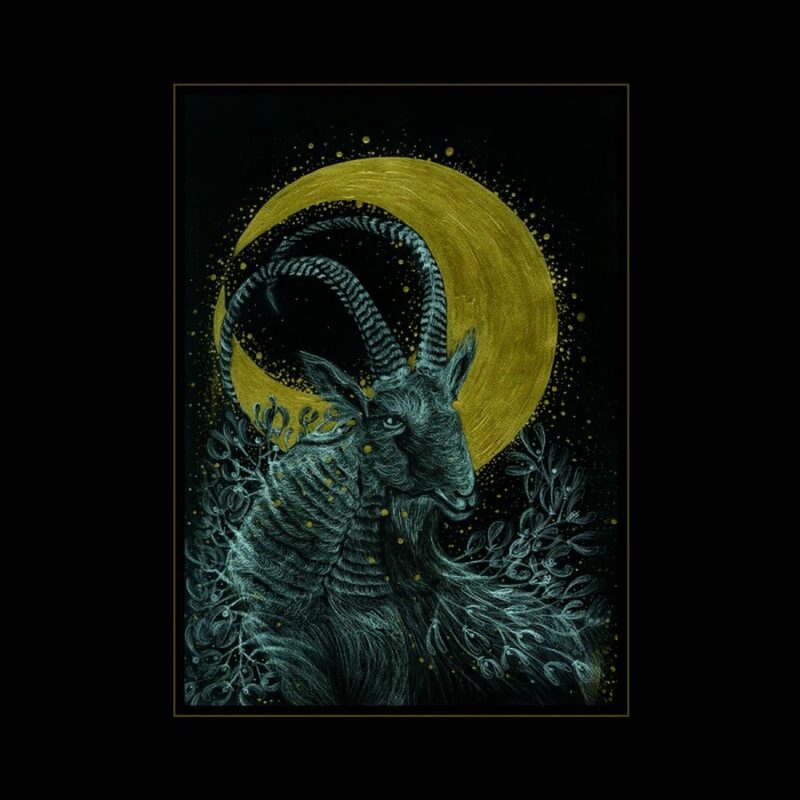 Printed on a matte finish, the gentle golds and the image of the horned beast brilliantly combine the blend of subtlety, occult mystery, and demonic possession witnessed throughout the album. Malignant Records knew they had found something special when deciding to work with Monocube. This album was not hastily prepared, being recorded between 2012 and 2016, Monocube was willing to take the time needed to properly bring these demonic incantations to life. Once they were ready to be unveiled, it is blatantly obvious that Monocube deserves to be ranked among the most elite of the ritual dark ambient genre. The album is as original as it is demonic, never leaving the listener lulling in a dull moment. It begs the question, what can Monocube possibly present next? With such a magnificent opus, the stakes will be set high for future albums by this gifted artist. We can only hope that he continues to pay as much attention to detail as he has with The Rituals. If so, we are likely looking at an artist that will become increasingly relevant and lauded as his career progresses. Thank you very much. I’m happy you enjoyed the read, and I’m sure you will enjoy the album!